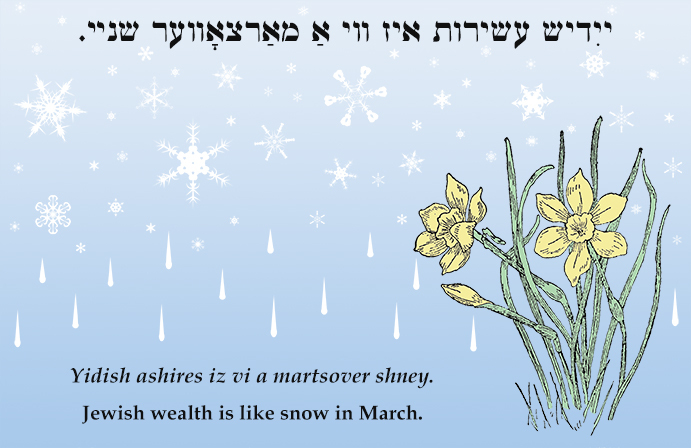 Yiddish Proverb: Jewish wealth is like snow in March. ייִדיש עשירות איז ווי אַ מאַרצאָווער שניי. Yidish ashires iz vi a martsover shney. Jewish wealth is like snow in March. Yidish ashires kumt mitn vint un geyt avek mitn roykh. Jewish wealth comes with the wind and goes up in smoke.